If the holidays tend to put you in a nostalgic mood, you’ll enjoy a visit to Christmas Village in Chippewa Falls’ Irvine Park. From Thanksgiving to New Year’s Day each year, this 318-acre park is transformed into a winter wonderland filled with life-size displays of Victorian-era scenes and more than 100,000 twinkling lights. A stroll or drive through this spectacular show on a frosty December evening is sure to send your holiday spirit soaring and make you feel like…well…like a kid on Christmas morning. This year, the annual holiday light display promises to be more dazzling than ever as the event celebrates its 30th year. Two new displays will be introduced to mark the occasion, including a 12-piece set paying tribute to the 12 Days of Christmas. The other new display—a replica of Chippewa Falls’ historic Hotel Northern—is in keeping with the Christmas Village’s tradition of showcasing Chippewa Falls landmarks. “When we started out, we wanted to make a little village kind of reminiscent of Chippewa Falls as it might have looked back in the Victorian era,” said Jean Arneson, who’s been a Christmas Village volunteer since the inaugural event in 1987. Arneson provides the artistic vision for the village; she conceived, designed, drew, and in many cases painted each of the 200-plus displays. 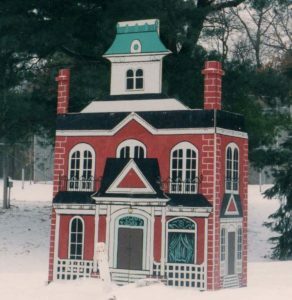 Many displays are replicas of historic or iconic sites of the Chippewa Falls area, including this representation of the Cook-Rutledge Mansion. Initially, Christmas Village was just that—a miniature community offering a step back in time to holidays past in the Chippewa Falls area. 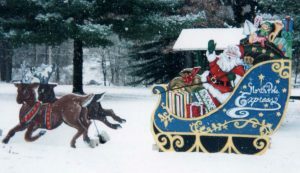 By the second year, the event was expanded to include more traditional Christmas elements, including a North Pole scene complete with Santa and his reindeer. This section of the park also has a nutcracker display and Christmas storybook area, where the newest 12 Days of Christmas scene can be found. 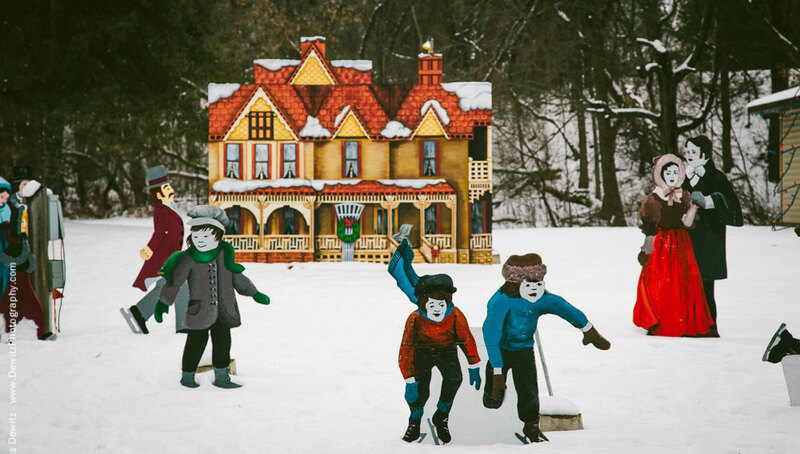 This display has Victorian-era townsfolk ice skating around the house of William Irvine, namesake of the park where Christmas Village is located. The Irvine Park Drive Bridge serves as the separation point between the Christmas Village’s two main sections; guests enter at the front into the Victorian Village and once they cross the bridge, they enter Santa Land. The park’s Band Shell holds a special tribute to the area’s Armed Service members and their families. Although Arneson conceived and created most of the holiday displays, Brunstad was the driving force behind Christmas Village’s third main focus—a tribute to Chippewa County’s Armed Service members and their families. 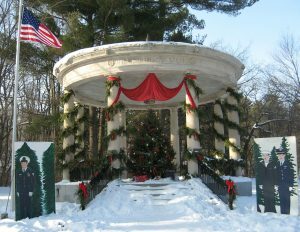 A visit to this display, located in the park’s 1924 Band Shell, has become a meaningful event in itself for many visitors. Brunstad noted the historic Band Shell is a memorial to “Our Soldiers and Sailors,” and therefore serves as an appropriate backdrop for this display. A 12-foot tree standing center of the Band Shell is dedicated to Armed Service members and their friends and families. Plywood cut-outs of servicemen and women—inspired by pictures of real servicemen and women from the area—stand at each side. Also on display are names of active-duty servicemen and women in Chippewa County. The list has grown from 19 names the first year to about 140 today. Brunstad said some people come back night after night to read through the names on the display and take a quiet moment to connect with their loved ones. The Christmas Village started as an outgrowth of the Chippewa Falls Chamber of Commerce Retail Committee, but it grew into an independent project involving individuals, businesses, volunteer organizations, and local government entities. Its growth each year in new exhibits and added lights has outpaced its growth in budget, thanks in part to a wealth of volunteer labor, but also to the switch to LED lights, which Brunstad said began in about 2005. 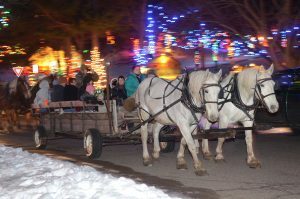 Tickets for popular horse-drawn wagon rides through Christmas Village are available at Gordy’s Market Service Center in downtown Chippewa Falls, but they go quickly! Brunstad added the switch to LEDs has also reduced some labor time, since the LED bulbs last longer and are much more durable. Not that labor is a problem. Christmas Village is a big community event, and it seems that just about everyone in the community has played a role of some kind at some time. The project is made possible by volunteers, who serve on the board of directors to help with planning, show up in the fall to begin setting up (this year’s set-up began in mid-September), maintain the displays and staff the event when needed during December, and break it all down again after the holidays. In addition, art students at Chippewa Falls Senior High School and McDonell Central High School have assisted with painting the majority of the displays. This year, by season’s end, about 300 volunteers are expected to have lent a hand, whether for one day or weeks at a time. Also, Brunstad noted that as the light show became a bigger part of the community, donations increased. The annual Collector’s Christmas Village Ornaments, sold each year since 1989 as a fundraiser for the event, have become coveted items. Each year’s ornament features a different scene from the Christmas Village, usually the newest display. This year’s ornament, commemorating the event’s 30th year, will pay tribute to Arneson, the originator of all the displays. The bulbs are sold at various places in Chippewa Falls for $5 each. With three decades of Christmas Village light shows in the books, the event has become a family tradition for many visitors, some of whom were brought to the park by their parents and are now bringing their own children. And while some of the favorite displays are by now quite familiar to those who come every year, the village itself is never the same. Arneson said the pieces are set up a little differently each year, and the light displays change each year as well. Irvine Park is located at 125 Bridgewater Ave., Chippewa Falls, WI 54729. 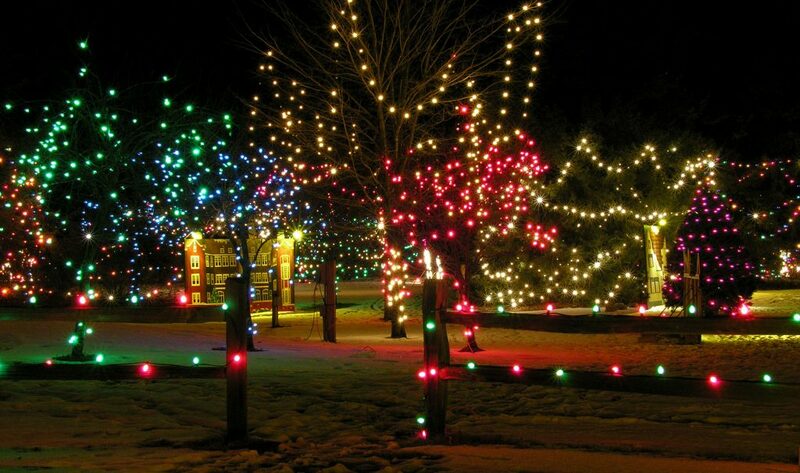 To learn more about Irvine Park and/or Christmas Village, visit www.chippewafalls-wi.gov or call 715-723-0051.